HWLH News Letter for November, 2014- Issue #0012 -Does Butter Coffee Actually Help With Weight Loss? November Issue # 012 - Is Butter Coffee Actually Good For Weight Loss? 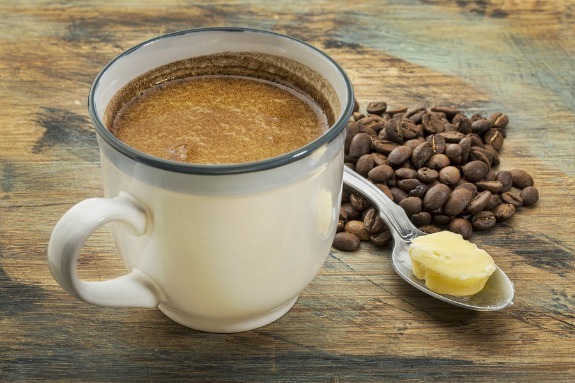 Butter Coffee (aka Bulletproof Coffee) is the latest breakfast sensation and popular weight loss trend, but does it really work?. This new trend of adding butter to your morning coffee isn't actually new at all. Apparently this concept has been around for years in places such as Tibet, where monks have been drinking this beverage for centuries. But here in North America it has recently become a hot new trend and overnight sensation. According to the latest weight loss news this butter coffee beverage has been made popular by Dave Asprey, the man who created the website called the BulletProof Executive. Certainly he's a genius when it comes to marketing as he took this beverage (that has been around for centuries), repackaged it, renamed it as "Bulletproof Coffee" and promotes it as a healthy weight loss drink. According to his bio, Dave lost 100 pounds without counting calories or without excessive exercise and uses this beverage as part of his daily diet routine. Bulletproof coffee claims to promote weight loss without exercise, increases energy levels and alertness and helps reduce hunger until lunchtime. It's considered to be a breakfast replacement. MCT oil stands for "medium chain triglycerides" and is made up of coconut and palm kernel oil. Some claim if you add this oil to your coffee you will speed up absorption in the body which helps increase calorie burning. Promotes fat oxidation, which means your body is using up stored fat to produce energy. Is this weight loss beverage a fad or fact? Though this breakfast beverage may sound a little odd to some, many others have made this drink part of their morning ritual. I've had people tell me that they love the creamy texture, buttery taste and some people swear by it. If you truly like this drink make sure you compensate for those extra calories somewhere else in your diet throughout the day. Others claim this beverage does not deliver what it promises and believes that Dave Asprey's Bulletproof Diet is just a clever gimmick to convince consumers that they must buy his bulletproof coffee to make this diet successful, along with other products he sells. As always, there are two sides to every coin. In a funny way, putting butter in coffee is not a whole lot different than using cream. After all, that's what butter is, it's cream that is churned until it turns into butter. Though neither butter or cream has ever been on top of the list when it comes to weight loss until now. It is important to keep in mind that this beverage has around 400 calories. That's a lot of calories for one drink, no wonder it is considered a breakfast replacement. Even those meal replacement drinks like Ensure Original (220 calories) or Ensure Plus (350 calories) have fewer calories than that. Another way to look at this, is there are a number of healthy breakfast meals that are filling and contain less than 400 calories, like a healthy bowl of steel cut oats, that stick to your ribs and satisfies hunger for hours. Compared to other breakfast choices, butter coffee is certainly limited in nutrition and offers no fiber content which is so important to maintain good digestion. For people watching their cholesterol levels, real butter will always contain cholesterol as it is made from animal fat. It is important to read all nutrition labels if you need to avoid cholesterol. So for those of you who have already tried this beverage or will be soon, it would be interesting to know which side of the coin you're on?